While spending some time looking at Clojure's concurrency model, I did a little bit of research into their persistent collection implementation that uses Bagwell's Hash Array Mapped Tries. After a little bit of thought it occurred to me that you could apply the persistent collection model to an implementation of ConcurrentMap. The simple solution would be to maintain a reference to a persistent map within a single AtomicReference and apply a compareAndSet (CAS) operation each time an update to the map was performed. In Clojure terms, a ref and swap! operation. However a typical use of ConcurrentMap is for a simple cache in a web application scenario. With most web applications running with fairly significant numbers of threads (e.g. 100's) it's conceivable that the level of contention on a single compare and set operation would cause issues. 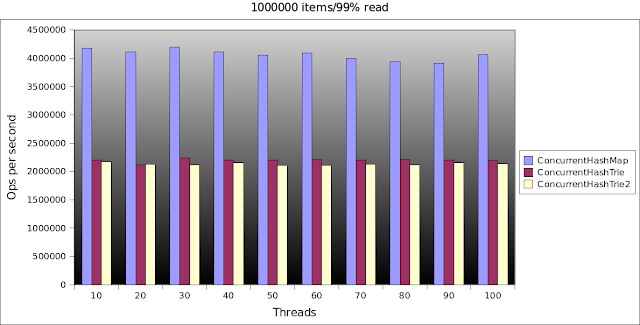 Non-blocking concurrent operations like compare and set work really well at avoiding expensive user/kernel space transitions, but tend to break down when the number of mutator threads exceeds the number of available cores*. In fact thread contention on any concurrent access control structure is a killer for performance. The java.util.ConcurrentHashMap uses lock-striping as a mechanism to reduce contention on writes. If absolutely consistency across the ConcurrentMap was sacrificed (more information below), then a form of "CAS striping" could be applied to the ConcurrentHashTrie to reduce contention. This is implemented by replacing the AtomicReference with an AtomicReferenceArray and using a hash function to index into the array. There are a number of implementations of the Bagwell Trie in JVM languages, however I couldn't find an implementation in plain old Java, so I wrote one myself. For the persistent collection it follows a fairly standard polymorphic tree design. The core type of Node has 3 implementations. The key one is the BitMappedNode, which handles the vast majority of branch nodes and implements the funky hash code partition and population count operations that make up the Bagwell Trie structure. LeafNode holds the actual key/value pairs and ListNode is there to handle full collisions. The key mutator methods of ConcurrentMap: put, putIfAbsent, remove and replace are implemented using CAS operations on the rootTable, which is an AtomicReferenceArray. As mentioned earlier, the ConcurrentHashTrie is not consistent for operations that occur across the entire structure. While at first look this seems terrible, in practical terms it is not really an issue. The 2 main operations this impacts are size and iteration. The size operation in the ConcurrentHashTrie is not O(1), but is O(n) where n is the size of the rootTable (or the number of stripes). Because it has to iterate across all of the nodes in the rootTable (it doesn't need to traverse down the trees) and add all of their sizes it possible for the size of a Node to change after it has been read but before the result has been calculated. Anyone that has worked a concurrent structure before has probably found that the size value is basically useless. It is only ever indicative, as the size could change right after the method call returns, so locking the entire structure while calculating the size doesn't bring any benefit. Iteration follows the same pattern. It is possible that a node could have changed after being iterated over or just before being reached. However, it doesn't really matter as it is not really any different to the map changing just before iteration started or just after it completes (as long as iteration doesn't break part way through). Note that Cliff Click's NonBlockingHashMap exhibits similar behaviour during iteration and size operations. Cliff Click kindly included a performance testing tool with his high scale library which I've shamelessly ripped off and used to benchmark my implementation. Apparently he borrowed some code from Doug Lea to implement it. I changed a sum total of 1 line. 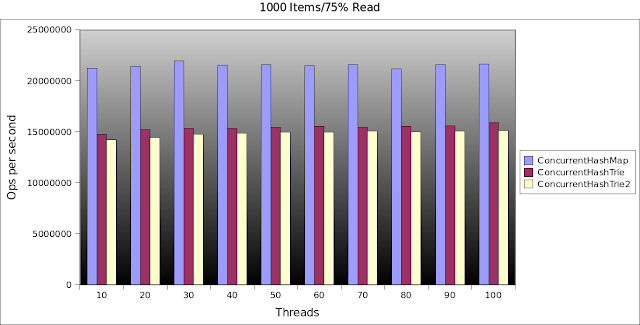 Writing benchmarks, especially for concurrent code, is very tough (probably harder than writing the collection itself), so borrowing from the experts gives me some confidence that the numbers I produce will be useful. Quite a bit slower than the java.util.ConcurrentHashMap. I didn't even bother comparing to the NonBlockingHashMap from the high scale library, the numbers would be too embarrassing. The ConcurrentHashTrie2 is an alternative implementation that I experimented with. I suspected the polymorphic behaviour of the tree nodes was causing a significant performance hit due to a high number of v-table calls. The alternate implementation avoids the v-table overhead by packing all three behaviours into a single class (in a slight dirty fashion). I stole a couple of bits from the level variable to store a discriminator value. The Node class switches on the discriminator to determine the appropriate behaviour. As the results show, it didn't help much. I ran a number of other permutations and the results were largely the same. So a question remains, is the approach fundamentally flawed or is my code just crap? I suspect the major cost is caused by heavy amount of memory allocation, copying and churn through the CPU cache caused by the path-copy nature of mutation operations. Also the read path isn't particularly quick. With a reasonably full map, reads will likely need to travels a couple of levels down the tree. With the traditional map, its a single hash and index operation. * I really need a proper citation for this. However imagine 16 cores and a 100 threads trying to apply a compare and set operation to the same reference. Unlike a lock which will park the threads that fail to acquire the lock, non-blocking algorithms require the thread that fails to apply its change to discard its result and recompute its result, effectively spinning until is succeeds. With more CPU bound threads than cores, its possible that the system will end up thrashing.